Take care of yourself so you can take care of your patients. Jessica Hauser presented a keynote presentation at the North Carolina Recreational Therapy Association (NCRTA) today [Mon. Oct. 15th, 2018] on Affects of Recreational Therapists Health and Well-Being on Patient Outcomes and Ways for Improvement. Jessica is a wellness coach and a nursing home administrator. Jessica provided a mindfulness box breathing exercise at the start of this session, which I personally found relaxing. Jessica disclosed some of her personal background and experiences. She was a studious child who loved reading and books. Her uncle had a cattle ranch transformed into a golf course when she was around the age of 10. She read her books in golf carts until one day she had a guy friend who won a trip to Disney for playing golf. She decided to check out golf. She was the only female player. She won the local and won the state just for showing up and bring present. She played in tournament in Orlando (circa 1996) and her parents took her to Disney. She started to really practice golf and got good at it. She went to East Carolina on a scholarship. Jessica wanted to be a physician. Her academic advisor told her that a student athlete is a full time job. She’d have to decide to play golf or be a physician. She choose to play golf! She ended up majoring in public relations. She didn’t know what she was going to do when she finished undergraduate school. She wasn’t going to be a professional golf player. So she went back to school to get her graduate degree in HealthCare Administration. She graduated and often heard: you’re great, but you need more experience. She did get at as a Nursing Home Administrator. She jumped in 150% like she did with school, learning, and golf. She worked long 10 to 12 hour days. There was a strong work culture there. She got a solo administrator job in 2010. She jumped head first. Emotionally – she felt stressed. She asked: can I do this for 40 years of my life? She didn’t have a plan. But she resigned. The universe works out. She got another administrative job. The pattern continues: stressed out, working a lot. Jessica disclosed developing unhealthy habits like binge eating, drinking and shopping. Just showing up like she did when she was younger wasn’t the same. She had must be there mentally as well as physically. Jessica disclosed having suicidal ideations. She was stressed, couldn’t sleep. Physician gave her antidepressants and sleeping aides. She disclosed drinking too. It got worse. Drinking with those prescriptions is a recipe for disaster. She wrecked her SUV one night. Fortunately, she didn’t kill anyone or herself. It was that day she asked for help. She is now focused on healing the healers. There are a lot of healers who are stressed with their work (just like she was). 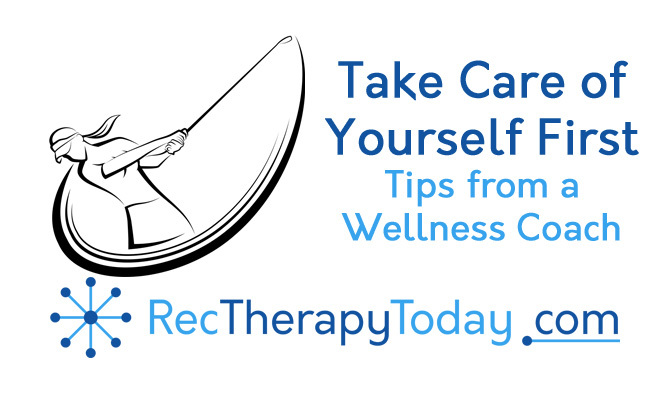 Danny Pettry comments: Recreational therapists are not immune to burnout and stress. She reported that 12% of medical professionals have substance abuse issues. Jessica thinks that number is skewed lower than it is because many professionals don’t disclose these issues. How can a professional (like a recreational therapist) help others if they are not doing well themselves. She gave the example of education for air planes – put your own oxygen mask on first. You can’t take care of anyone else if you don’t do this. Stressed out professionals have high rate of turnover, they are working with less staff due to opening positions and picking up a lot of overtime to fill the open shifts and experience burnout. The problem is when people just show up physically (but not mentally) due to stress. It becomes dangerous. She gave rhetorical questions: would you ask an obese person to help if you wanted to get in shape? Would you ask a bankrupt person for help if you wanted to be better off financially. Danny Pettry’s thoughts: you might be able to learn some (not to do things) from people who are suffering as well. Jessica pointed out that most people would seek out someone who is healthy for health advice or someone who is financially well for financial advice. It is unhealthy if we, recreational therapists (or allied professionals) are unhealthy. Stress causes the flight or fight response, so Jessica recommended for us recreational therapists to practice what we preach, and live a healthy lifestyle. Getting physical to get that energy out. Writing a goal or intention for the day like: Today I am going to have a great day). Feed your mind to grow as a person. Read a lot. (Both fiction and non-fiction). Jessica shared: Practice these skills (not perfection). She argued, it isn’t selfish to take care of yourself. Danny Pettry comments: Ethically – taking care of yourself is the right thing to do. Jessica shared: you can’t give away what you don’t already have. She is available for coaching and speaking.